The Guest Access feature allows you to create a separate Wi-Fi for your guests without allowing them to access your main network and the computers connected to it. After running the Smart Setup, the Guest Access feature is automatically turned ON. A Guest Wi-Fi is created automatically on the router's 2.4 GHz band. The latest dual-band and tri-band routers also support Guest Wi-Fi for both 2.4 GHz and 5 GHz bands. Be sure to remember this if you're connecting other networking devices, such as an extender. It should be configured to use the main network, not the Guest Wi-Fi. However, if you wish to extend the Guest Wi-Fi, keep in mind that any client connected to the extender will only have access to the internet, not the network. 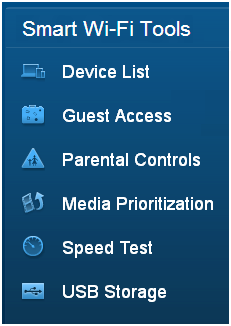 The Guest Access settings in the web-based setup page may differ depending on your router's model. See images below for comparison. If you bypass Smart Setup, the Guest Access Wi-Fi is OFF until you manually enable it. This section will show you how to enable your Guest Access manually. 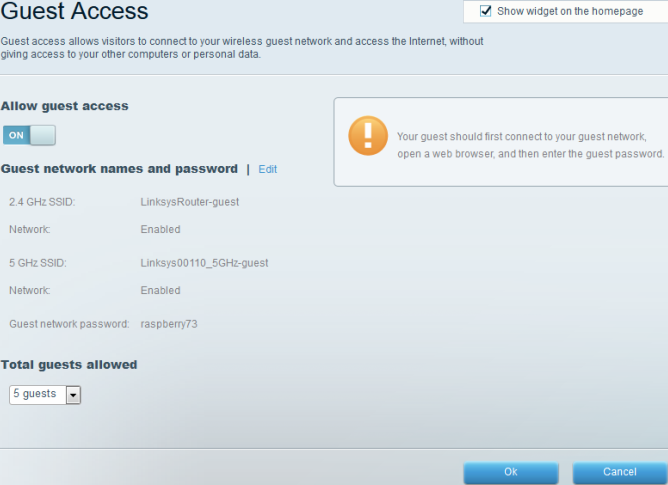 Access your Linksys cloud account via a web browser. For instructions, click here. On the left navigation panel, click Guest Access. Toggle the button below Allow guest access to enable Guest Access. Click Edit if you would like to change the Guest Wi-Fi name and password. Enter your desired Guest Wi-Fi name and password in the fields provided. NOTE: You can allow up to 50 guests to connect simultaneously. Your guests can now connect to your Guest Wi-Fi to access the internet. NOTE: The Guest Wi-Fi appears to be unsecured when you search for Wi-Fi but it would prompt for the Guest password once you open a web browser. 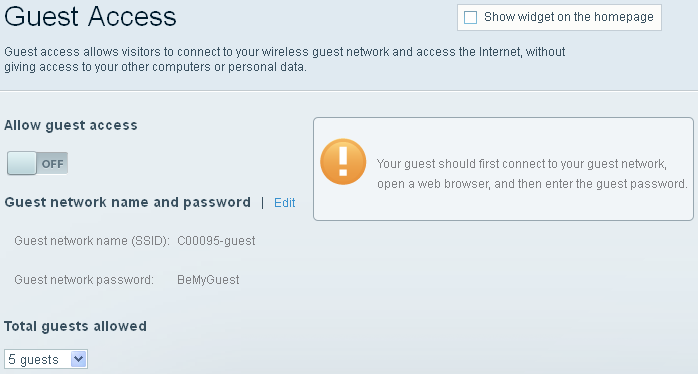 The Guest Wi-Fi is a different network from the main network and will NOT have access to any devices connected to the main network.